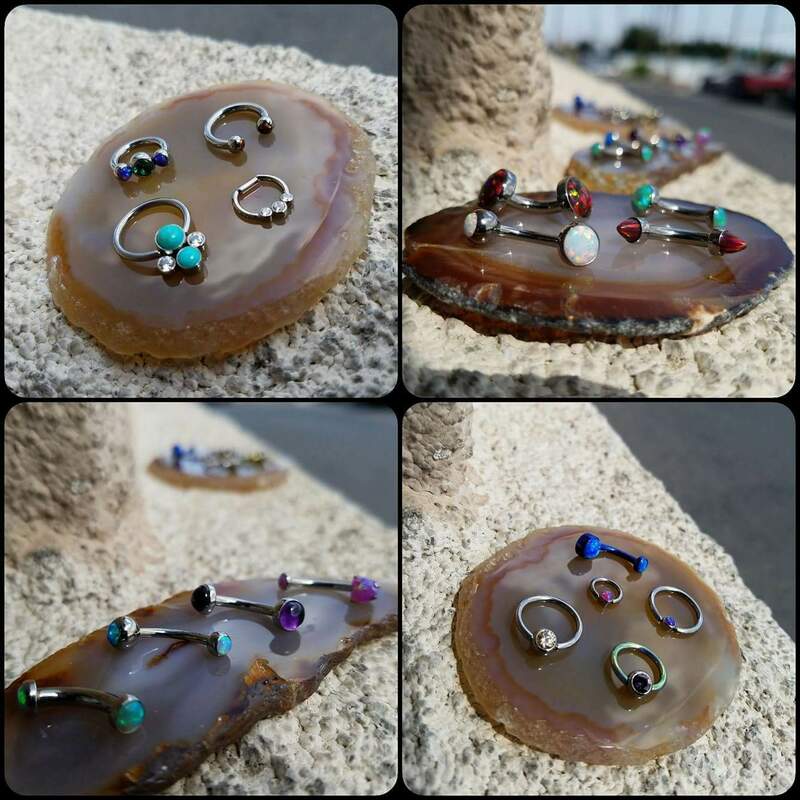 Looking for a Maui, Henderson & Las Vegas Body Piercing Shop near by? The Skin Factory Tattoo & Piercing shop has you covered. Las Vegas Body Piercing Shop the Skin Factory Tattoo & Body Piercing welcomes you to visit our tattoo shops in Las Vegas or Henderson, Nevada. We pride ourselves on being a customer oriented and a friendly Las Vegas tattoo shop. Your Las Vegas tattoo should be an experience that you will cherish your entire life. Our handpicked tattoo artists deliver custom, high quality tattoo art work and body piercing at affordable rates. Call us today for an appointment. Las Vegas Body Piercing Shop the Skin Factory now offers the best in Piercing Services. Over the past few years, body piercing has crossed many boundaries and is popular among all age groups. It is becoming a more widely acceptable for of self-expression. Gone are the days when body piercing was considered to be a form of rebellion. Body piercing is now a way to show your individuality and style. Like tattoos, body piercing is now visible in many walks of life and is acceptable in many workplaces. Las Vegas Body Piercing shops offer services for every type of piercing. The body can be pierced almost anywhere where there is enough skin to couch the piercing. Obviously no two people are the same so the placement of the piercing has to be done to suit each individual. Lastly, you must be aware that no two people will heal in the same way. The biggest misconception about body piercing is that anyone can do it. There are many risks involved if the piercer is untrained, or does not have access to the correct equipment. It is not possible to learn how to pierce by completing a short training course. Body piercing goes way beyond the “don’t try this at home” warning! You need to have properly trained and experienced technicians in a modern, sterile environment. Skin Factory Body Piercing is the Las Vegas Body Piercing Shop of choice. Your safety is our priority. Our studio is Health Department approved, with hospital sterilization. We offer a professional environment with skilled staff that will give you a safe and comfortable atmosphere for your body piercing. As mentioned, there are many areas of the body that you can have pierced. Antitragus Piercings – This is a piercing of cartilage directly across from the Tragus. Cartilage Piercings/Helix Piercings – Any piercing of the cartilage towards the top of your ear. Conch Piercings – This is a piercing of the lower cartilage just inside the ear, where it scoops inward. Daith Piercings – A Daith Piercing is done right above the Tragus, where the ear curves in from where it attaches to your head and towards the Conch area. Earlobe Piercings – 1 or more piercings that go through the earlobe, typically starting towards the bottom-center of the lobe. Industrial Piercings – An Industrial Piercing goes through 2 points of cartilage at the top of your ear, as shown in the diagram. Typically a straight barbell is inserted initially, but you may heal better with 2 captive bead rings. You can always insert a straight barbell in 7-12 months, once your piercing is well healed. Orbital Piercings – An orbital piercing is actually 2 earlobe piercings, done along the edge of the lobe, that are connected with a single piece of jewelry. 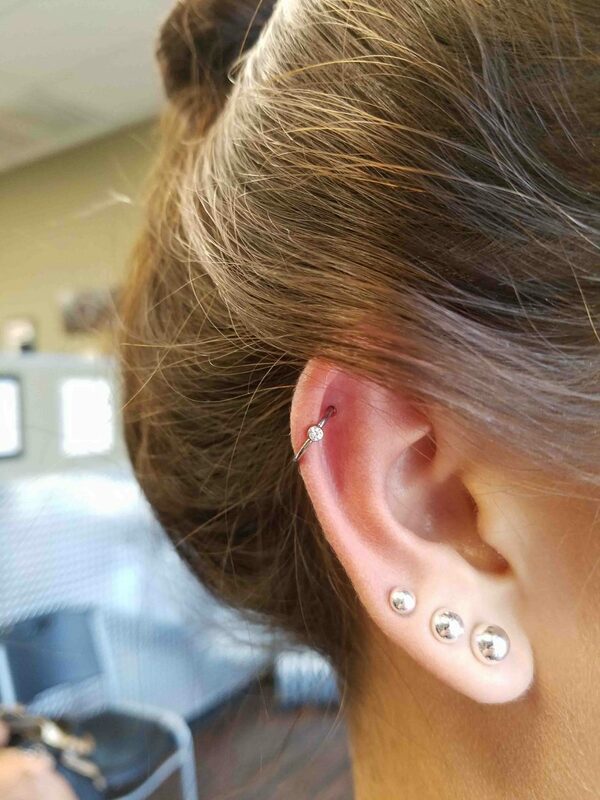 Rook Piercings – This is a piercing of the cartilage that juts out between the upper half of the Conch and the top of the ear. Snug Piercings/Anti-helix Piercings – A Snug (A.K.A. Anti-helix Piercing) goes through the cartilage along the inner edge of the central outer ear, just above where the lobe ends. Tragus Piercings – This is a piercing of the lower flap of cartilage where your ear connects to your face. Triple Helix Piercings – A Triple Helix is 3 Helix Piercings in a row, often connected with a single piece of spiral jewelry. Anti-Eyebrow Piercing – This piercing typically appears at a slight angle below the outer corner of the eye instead of on the eyebrow. Bridge Piercings – This is a type of surface piercing where the bridge of the nose is pierced, in between the eyes. Eyebrow Piercings – These can be placed horizontally across the eyebrow, but they’re usually placed vertically. This is a surface piercing, which means it will be more prone to rejection than some other piercings. Your piercer needs to pinch enough skin and use jewelry in a slightly heavier gauge to minimize your chances of having your jewelry migrate out. Lip Piercings – there are many types of lip piercings: angel bites, vertical lip piercings, canine bites, dahlia piercings (Joker bites), dolphin bites, horizontal lip piercings, labret piercings, medusa piercings, Monroe/Madonna piercings, snake bites, and vertical labret piercings. Septum Piercings – These go through the septum, at the center base of the nose. Tongue Piercings – Typically these are just done as single piercings towards the center of the tongue, but some people choose to have multiples done. A Dermal piercing and surface piercings offer a very different look because they don’t have a separate entrance and exit point and they just stay on the surface of the skin. The jewelry lies along the surface and is held in place by an anchor located just below. Both types of piercings offer a creative way for individual expression using a wide variety of jewelry and accessories. The Dermal Piercings are single point surface piercings, which differs from the traditional surface bar piercing. A needle is used to create a small hole in the skin and then the dermal anchor is inserted. Once the piercing is done, you see only the decorative top of your choice on the surface of the skin. This exposed piece on the surface of your skin has internal threading, making your jewelry top interchangeable. Surface piercings are anchored using barbells that are shaped like open staples. A hollow needle is used to pierce the skin and act as a guide for the barbell to be inserted. When it has been properly positioned, decorative jewelry tops can be put in place. A surface piercing is more invasive than a dermal piercing because the barbell must be guided under the skin for a specific distance, while a dermal has just one point of entry. The dedicated, professional, and talented staff at Skin Factory Las Vegas Body Piercing Shop is available to answer any questions you have about body piercing. Come and see our Body Piercing Artists for your next piece of Body Art. Click here for more Body Piercing ideas. Need a Tattoo? We also have a Las Vegas Tattoo Shop in Las Vegas and Henderson. Our Henderson location also offers Tattoo Removal. Contact us today.